The FW17/18 collection from Replay & Sons is dedicated to little “Rebels and heroes” – a journey to the brand’s deepest roots through a fun interplay of styles, where biker influences, military trends and references to the American college world combine to create a lively, spirited collection. 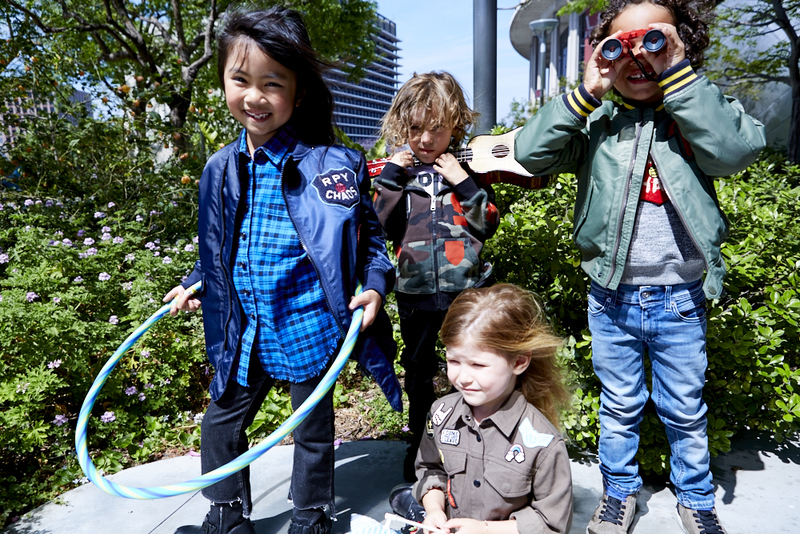 For boys, the collection takes shape through the power of the military world, which is intertwined with the more typical elements of college style, while biker influences come through in the rock ‘n’ roll graphics of the t-shirts. Iconic garments like parkas, bombers and cargo pants in camouflage print or in military versions are revamped and mixed with college sweatshirts, while denim shirts are enlivened by coloured patches and messages. Standing out among the various colours are blue and red in the college style garments, while the biker world is recreated by classic black with a distressed look, giving also extra appeal to must-have pieces like the long woollen bomber with eco-leather sleeves. Denim focuses on clean lines, where shades of blue and black dominate, moving through nuances that bring out a strong vintage appeal without forgetting the soft-touch which ensures maximum comfort for little ones. Patches, abrasions, creasing, mended effects, prints, embroideries, college and military style appliqués are perfect for making denim fun, while basic shirts and jackets complete the look. The collection offers 5 different fits: super slim, slim, regular slim, slim low crotch and the new ergonomic solution which stands out for its ergonomic seams and tight fit. Lastly, also for FW17/18 we find one of Replay’s “must haves” in denim: the Hyperflex model which, offered also in a black denim version, is the perfect mix of innovation and authenticity. The GIRL collection comes in three themes. College, military and biker style are combined to give life to more feminine solutions thanks also to touches of red, pink and royal blue which brighten up the main colours of the collection, black and khaki green. The college-themed woollen coat and long bomber are maxi and reinterpreted with a playful twist through contrasting coloured patches. Sweatshirts and t-shirts with college-style prints and embroideries go perfectly with check shirts, while practical dresses in jersey or with eco leather inserts complete the look. The camouflage parka is reinterpreted for girls with fun printed patches and hoods enhanced with coloured faux fur inserts which make the military mood more feminine. Floral prints, pleated skirts and t-shirts with glitter prints or laminated fabrics soften what is a strictly male inspired theme. For smaller girls the biker theme is made bolder by garments such as the classic biker jacket and coloured faux furs. The mood is softened by little dresses in crêpe or in chiffon enhanced with all over prints, white blouses in poplin with macramé lace collar or sweatshirts and t-shirts with macramé or glitter prints. The denim comes in nuances of black and blue. Clean lines and essential style are interrupted by faded effects and rips or by patches, coloured embroideries and laser prints. The power stretch denim is used for the five-pocket jeggings with an extremely tight fit. Completing the denim range are little jackets with a powerful vintage appeal and faux fur inserts, large shirts and dress with laser prints and patches that go perfectly hand in hand with the theme of the collection. The fits, beside the still on-trend skinny, super skinny and boy fit denim, include the cropped bootcut and the carrot, which is marked by a tight waist and looser leg for maximum freedom of movement. Girls also get the “Hyperflex” model, a Replay must-have which also comes in a black denim version.